The University of Colorado Colorado Springs softball team will be hosting Chadron State College in a four-game series at Mountain Lion Field. Due to potential inclement weather, the schedule of the games has been changed. Instead of playing on Saturday and Sunday, there will be three games on Friday, Mar. 1 at 10 a.m., 12 p.m., and 2 p.m. and one game on Saturday, Mar. 2 at 10 a.m. However, if the weather permits it, the schedule could change to a double header on Friday and a double header on Saturday, in which case the games would be played at 10 a.m. and 12 p.m. on both days, respectively. Stay tuned to http://www.gomountainlions.com for any updates. From 2013-16, UCCS played Chadron State 12 times in the regular season and two times in the Rocky Mountain Athletic Conference (RMAC) Tournament. The Mountain Lions' record against the Eagles in those 12 games was 5-7. During that span, UCCS averaged around five runs per game (5.2) with a high score of 14, while Chadron State averaged an even six with a high score of 12. UCCS' best single season performance against the Eagles came in 2015 when they won two of the four games played. 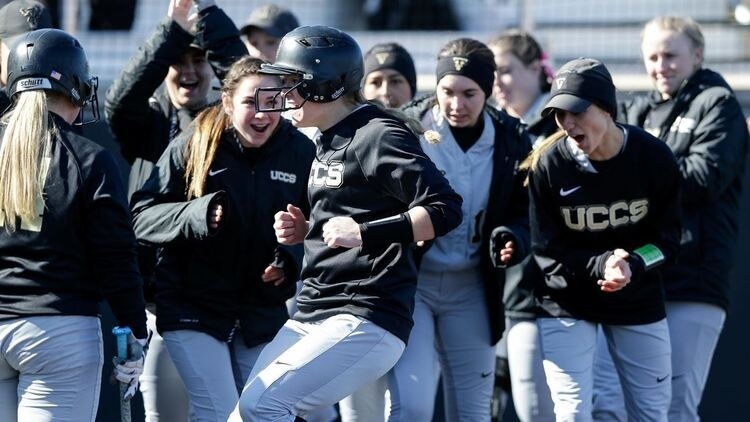 In their two wins, UCCS scored 25 runs on 24 hits including five home runs. In the RMAC Tournament, UCCS has a 1-1 record against Chadron State, with their win coming in extra-innings by a score of 4-3 in 2014. These two teams have consistently played close and competitive games, as shown by the fact that in 14 games played these two team's runs per game average is separated by less than one run. After taking a two-year hiatus from competing, UCCS will look to re-gain the overall series edge this weekend. Chadron State has gotten off to a slow start this season as they currently post a record of 3-11 overall, which includes an 0-4 record in the RMAC. The Eagles played Metropolitan State University Denver in their first RMAC series of the season. In the four games played, Chadron State tallied only eight runs on 22 hits and gave up 27 runs on 39 hits. Their best overall performance came against Western New Mexico University with a decisive 11-2 victory. In that game, the Eagles had eight hits including three doubles and one home run. As a team, Chadron State has a .288 batting average and 13 home runs overall this season. Individually, the Eagles are led by freshmen Haleigh Hoefs and Bailey Marvel and senior Kayla Michel. Hoefs is leading the team in batting average (.463), hits (19) and doubles (eight) and is second on the team in RBI with 14. She also has two home runs on the season, good enough for third on the team. Marvel is tied for the team lead in hits with Hoefs (19), and is second on the team in batting average, currently hitting .396. Michel currently has 12 hits and a .279 batting average this year but has made the most of her hits when they come. Of her 12 hits, six of them are extra-base hits which includes a team high four home runs and has earned her 17 RBI on the season, which also leads the team. Defensively, the Eagles have struggled pitching this season. Megan Horn (1-0, 1.40 ERA) pitched in Chadron State's best performance this year and got the win. Of the pitchers on the team with at least five appearances, Dallas Magnusson (0-2) has the best ERA (3.18) and leads the team in strikeouts with 11. Cassidy Horn (1-1) is the next closest in ERA and strikeouts with a 7.74 and 10 respectively in eight appearances. UCCS could not have started their RMAC schedule any better as they went 4-0 against CSU-Pueblo last weekend. In those four games, the Mountain Lions had a team batting average of .349, scored 40 runs on 37 hits and blasted 10 home runs. UCCS held CSU-Pueblo to a .295 batting average, 11 total runs and only one home run. Five different players for UCCS had at least five hits and all of those players had at least one home run. Melissa Martinek (.412 BA), Payton Romines (.325 BA), Taylor Reidhead (.297 BA), Alex Cook (.381 BA) and Rayle Glover (.365 BA) all had stellar weekends against CSU-Pueblo offensively. Martinek and Romines both had six hits over the weekend, with Martinek recording two doubles, two home runs and eight RBI and Romines recording one double, three home runs and seven RBI. They would finish the weekend with batting averages of .545 and .465 respectively. Reidhead, Cook and Glover all had five hits of their own over the weekend as well. Reidhead would finish the weekend with one home run, six RBI and a .417 batting average. Cook finished with the same number of home runs as Reidhead (one) and the same batting average (.417), but would add a double and tally five RBI of her own. Rayle Glover finished the weekend with a .313 batting average, the team's only triple of the series, two home runs and six RBI. Together, these five players totaled 27 of the 37 hits for UCCS, nine of the 10 home runs and 32 of the 38 RBI. Defensively, all three of UCCS' pitchers played great as well, each picking up a win with Taylor Reidhead tallying two. Braelyne Crenshaw (2-3) had the best performance of the weekend with a seven-inning shutout of the ThunderWolves, during which she only gave up six hits and struck out four. Cami Duffey (3-2) also pitched well, earning her victory by giving up only five runs (three earned) off of 10 hits with two strikeouts in five innings pitched, giving her a 4.20 ERA for the weekend. Taylor Reidhead (3-3) was the only pitcher to pitch in two games over the weekend. She would throw a total of 13 innings, give up only six runs (five earned) off of 15 hits and rack up an impressive 17 strikeouts, leading to an ERA of 2.69 for the weekend. UCCS will look to build off this dominant series and carry momentum into their series against Chadron State. The forecast for this upcoming weekend shows a high of 53 degrees with 11 mile per hour winds on Friday, a high of 33 degrees with afternoon snow showers on Saturday and a high of 19 degrees with potential morning snow showers on Sunday. Winds will likely gust up to 13 miles per hour on Saturday and 10 miles per hour on Sunday. As snow is expected for the weekend, stay tuned to gomountainlions.com for any schedule changes. UCCS will be traveling to Las Vegas, New Mexico to take RMAC opponents New Mexico Highlands University and MSU Denver. The games are slated for the usual Saturday, Sunday schedule, with a double header on each day. On Saturday, Mar. 9, the Mountain Lions will play New Mexico Highlands at 11 a.m. and MSU Denver at 1 p.m. On Sunday, Mar. 10, UCCS will play MSU Denver at 12 p.m. and New Mexico Highlands at 2 p.m.